Dissolves on the tongue. No water needed. Food supplements with sweeteners. You, but on a really good day- everyday. Sugar and caffeine free. For every day use. 1. Helps you feel energised: the vitamin B1 and B2 in Berocca work with your body to naturally release energy from your food. 2. Reduces tiredness and fatigue: the vitamin B3, B6 and magnesium in Berocca help reduce your tiredness and fatigue. 3. Supports mental performance: vitamin B5 contributes to your mental performance. Suitable for vegetarians and vegans.Want to take me anywhere, any time? Life's busy and hectic - Be ready with Berocca! Start every day with Berocca... A specially tailored formula containing all 8 B vitamins, which are scientifically proven to work with your mind & body to support your energy & mental performance - setting you up for the day ahead Berocca fizzy melts are specifically designed to dissolved on your tongue without the need for water- offering a convenient & easy way to support your energy How can Berocca® help you stay on top form? Helps you fell Energised: Contains 7 B vitamins, including B1 and B2, which work with your body to naturally release energy from your food Reduces Tiredness & Fatigue: Contains 6 B vitamins, including B6 & B12, and magnesium to help reduce your tiredness & fatigue Supports your Mental Performance: Contains vitamin B5 which contributes to your mental performance Berocca Orange Energy Vitamin Fizzy Melts Berocca Fizzy Melt Tablets offer all the same great benefits of Berocca but in a convenient, on-the-go format. 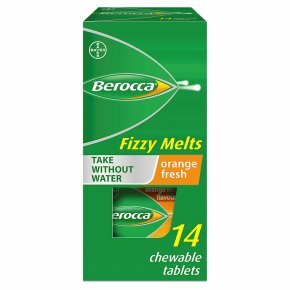 Designed to gently fizz and melt on your tongue without water, releasing a refreshing orange taste, Berocca Fizzy Melt Tablets are the perfect way to help keep you feeling energised, on the go, without the need for water. - Keep out of sight and reach of young children<br>Need to know:<br>- Berocca can be taken every day throughout the year but should not be used to replace a well-balance diet and healthy lifestyle<br>- Contains only 2 calories (2kcal) per tablet<br>- Do not exceed the recommended daily dose<br>- Not recommended if you are pregnant or breast feeding<br>- Not suitable for people with kidney problems<br>- Excessive consumption may cause laxative effects.